BS: Tax-stamped, volume listed as 4/5 of a quart. In a bottle resembling Blanton’s with a gold tassel. CB: Sourced whiskey treated with a patent-pending process intended to speed up aging. The process involves the use of high-pressure, “oxygen infusion” and “heat processed, charred white oak segments”. BS: Light orange. Slightly cloudy with “dusty” floaters. Some light necklacing. CB: Mahogany with thin, clingy legs. BS: Wood varnish, the lumber section at a hardware store. CB: Dry erase marker, grape jelly. BS: Thin and light. Like sawdust-infused vodka. CB: Medium bodied. Like sucking on a grape-scented marker. BS: Resembles accidentally inhaling sawdust and then washing your mouth out with cheap vodka. Fades into a locker-room. CB: Lots of burn, which covers up the taste nicely. Fades into a headache. Parting words: This is a head to head I’ve been wanting to try for a long time. On the surface, these two whiskeys don’t have a lot in common. Bourbon Supreme is a “dusty” that was made in Illinois at an industrial alcohol plant and Cleveland Whiskey is a new product made in Cleveland by a startup company. What they do have in common is that they are two of the most frequently mentioned names in discussions of the worst American whiskeys ever made. They live down to the hype. Bourbon Supreme quickly belies its origins as industrial alcohol more suited to use as racing fuel than a beverage. The wood notes are very clear, but there is no integration and no balance with anything resembling traditional bourbon flavors like caramel, vanilla or spice. Cleveland Bourbon resembles something kids might huff to get high. The headache mentioned in the finish came on just seconds after I swallowed the first sip. It was remarkable. I have never had that experience before, except for a Croatian Cabernet that gave me a headache at the moment I first smelled it. At least Croatian wine let me know how awful it was right off the bat. Can anything good be said about either of these? Bourbon Supreme is still fairly easy to find on shelves (for obvious reasons) and the bottle would look attractive as a display piece on the back of a bar. Cleveland Bourbon also has an attractive bottle, is 100 proof and is only $30 which makes it cheaper than most “micro” products of similar age. Still, these are both terrible products, worthy of their place in the “worst ever” discussion. I will say that I have tasted something worse than these two bourbons: these two bourbons vatted together. Neither Bourbon Supreme Rare or Cleveland Bourbon Black Reserve are recommended. 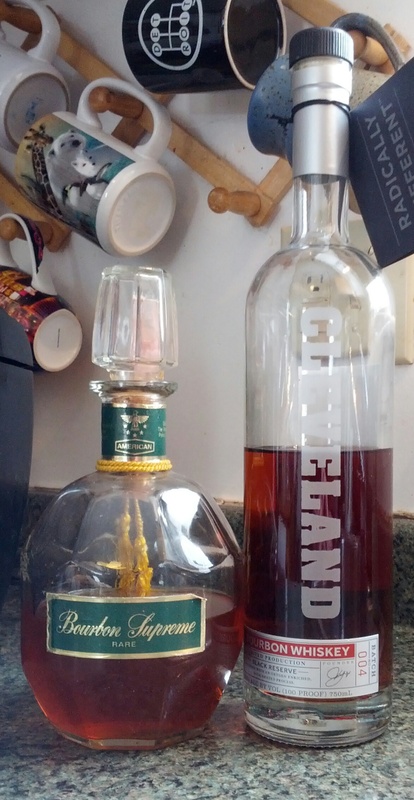 I haven’t had Bourbon Supreme but I’ve tried two different batches of Cleveland Whiskey, and I must say, I disliked every minute of the experience. My hat is off to you, Josh, for having the fortitude that so many of completely lack; and tasting these for us. ….Both at the same sitting!!! Besides a ‘hats off’, may I also offer an electronic Bromo-Seltzer, for whatever that’s worth. The Bourbon Supreme from the 1960s and 1970s was EXCELLENT. You must have found a drank bottle along the roadside that someone urinated for your taste evaluation and didn’t know the difference…..
That is the first time I have ever heard anyone say anything positive about Bourbon Supreme. I guess every bourbon out there is somebody’s favorite. I absolutely loved bourbon supreme back in the later 60’s and early 70’s. It was quite smooth with a slightly creamy finish to it.